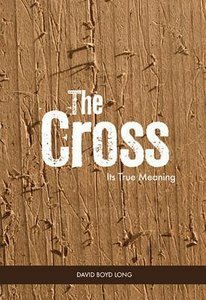 :The true significance of the cross of Christ is often misunderstood. It is more than just another term for the death of the Lord Jesus. In reality it is the symbol of man's total rejection of the Son of God. It is the evidence of his desire, by crucifixion, to degrade Him and destroy all thought of His worth. In a day in which many preach an easy gospel, the author gives meaning and perspective of Christ's claim on the believer. Mr Long points out very clearly, and with deep feeling that where the term is found in the New Testament it has a vital impact for the believer. He must follow his Lord by denying himself, taking up his cross, and following his Master. The cross is a symbol of rejection, and the acceptance of its real meaning by the believer is essential for true discipleship. This truth is expounded with thoroughness and clarity by taking up each reference to the cross in the gospels and the epistles, and applying it in a practical way to life today.